Taysom Hill is a professional quarterback with the National Football League. 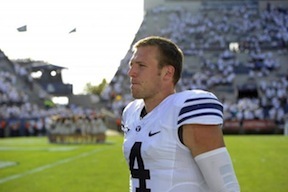 He was a quarterback with the Brigham Young University Cougars and finished his notable college career after the 2016 season. Hill played football in his native Pocatello, Idaho. As a senior in high school, he was 2008 5A All-Idaho Player of the Year and Idaho’s Gatorade High School Player of the Year. He was listed as the 30th best quarterback prospect in the nation coming out of high school. He also lettered in basketball and track and field. During his 2012 freshman year at BYU, he started in two games and played in six games where he completed 42 of 71 passes for 425 yards and four touchdowns before he suffered a season-ending knee injury. During his sophomore year (2013), he started all thirteen games and racked up a long list of awards and BYU records. He finished the season ranked as number 3 in BYU history for most rushing yards in one season. In 2014 at BYU, he was named to the Heisman Trophy watch list and other watch lists. He also suffered a season-ending leg fracture and ligament tear in the game against Utah State University. In 2015, during his college football career, he was named to several watch lists, including the Maxwell Award, the Wuerffel Trophy, the Davey O’Brien Award, the Manning Award, the Walter Camp Player of the Year, and the Johnny Unitas Golden Arm Award. He suffered a season-ending Lisfranc injury in the Cougar’s opener against Nebraska in September 2015. He announced in February 2016 that he would finish at BYU, despite being recruited by coaches at other schools, including Bronco Mendenhall, who wanted Hill to join him at Virginia. He spent the off season with trainers, physicians, and conditioning experts and patiently followed their protocols. He competed with Tanner Magnum in August 2016 to start for BYU against Arizona. After BYU, Hill was undrafted in 2017 and signed with the Green Bay Packers where he played three preseason games. He was waived on September 2, 2017. He plays quarterback for the New Orleans Saints of the NFL. During his debut game, he was listed as the number three quarterback on the Saints’ depth chart. Early in the game he blocked a punt and helped force the punter to drop the snap. Then a tackle on a kickoff return pleased Head Coach Sean Payton and Payton said that Hill is the quarterback of the future once quarterback Drew Brees retires. Hill is a member of The Church of Jesus Christ of Latter-day Saints and served a full-time mission to Sydney, Australia. He married Emily Nixon in 2014. This page was last edited on 30 January 2018, at 16:49.